The wonders of graphene are numerous—it can enable flexible electronic components, enhance solar cell capacity, filter the finest subatomic particles and revolutionize batteries. Now, the "supermaterial" may one day be used to test for amyotrophic lateral sclerosis, or ALS—a progressive, neurodegenerative disease which is diagnosed mostly by ruling out other disorders, according to new research from the University of Illinois at Chicago published in ACS Applied Materials & Interfaces. When cerebrospinal fluid from patients with ALS was added to graphene, it produced a distinct and different change in the vibrational characteristics of the graphene compared to when fluid from a patient with multiple sclerosis was added or when fluid from a patient without neurodegenerative disease was added to graphene. These distinct changes accurately predicted what kind of patient the fluid came from—one with ALS, MS or no neurodegenerative disease. 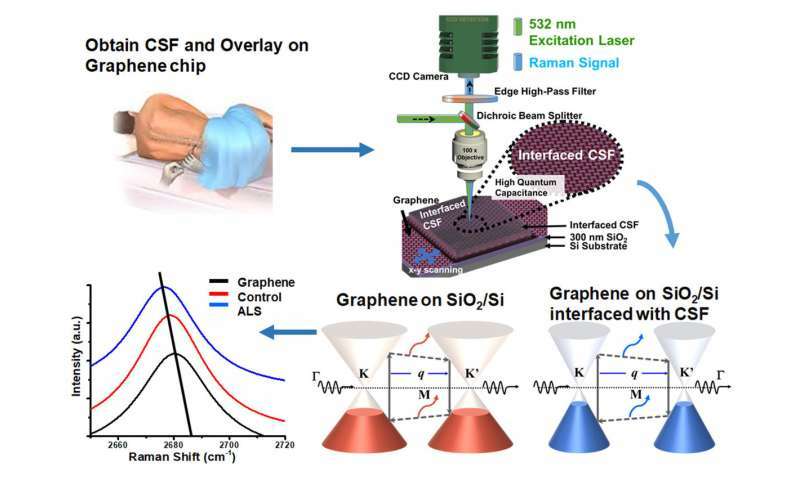 Berry and his colleagues used graphene to identify whether the cerebrospinal fluid was from a patient with ALS or multiple sclerosis—two progressive neurodegenerative disorders—or from someone without neurodegenerative disease. Since there is no definitive test for ALS, an objective diagnostic test would help patients start receiving treatment sooner to slow the disease. Berry believes the graphene is picking up on the unique biosignatures—combinations of proteins, and other biomolecules—present in the cerebrospinal fluid of individuals with different diseases.